A futures market is normal if futures prices are higher at longer maturities and inverted if futures prices are lower at distant maturities. As we approach contract maturity (we might be long or short the futures contract, it doesn’t matter), the futures price must converge toward the spot price. The difference is called the basis. That’s because, on the maturity date, the futures price must equal the spot price. If they don’t converge on maturity, anybody could make free money with an easy arbitrage. The most rational futures price is the expected future spot price. For example, if you and your counterparty both could foresee the spot price in crude oil would be $80 in one year, you would rationally settle on an $80 futures price. Anything above or below would represent a loss for one of you. Now we can define contango and normal backwardation. The difference is normal/inverted refers to the shape of the curve as we take a snapshot in time. Contango and normal backwardation refer to the pattern of prices over time, specifically if the price of the contract is rising or falling. Contango is when the futures price is above the expected future spot price. Because the futures price must converge on the expected future spot price, contango implies futures prices are falling over time as new information brings them into line with the expected future spot price. Normal backwardation is when the futures price is below the expected future spot price. This is desirable for speculators who are net long in their positions: they want the futures price to increase. So, normal backwardation is when the futures prices are increasing. Consider a futures contract we purchase today, due in exactly one year. Assume the expected future spot price is $60 (the blue flat line in Figure 2 below). If today’s cost for the one-year futures contract is $90 (the red line), the futures price is above the expected future spot price. This is a contango scenario. 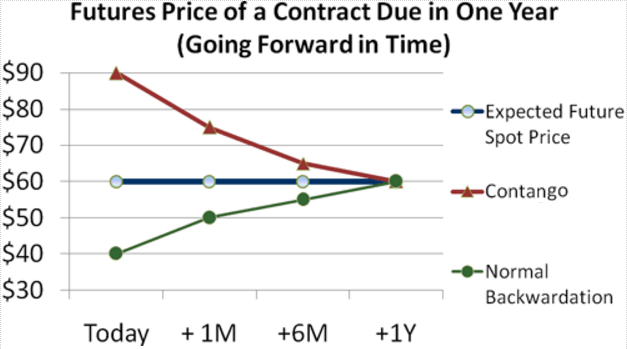 Unless the expected future spot price changes, the contract price must drop. If we go forward in time one month, we will be referring to an 11-month contract; in six months, it will be a six-month contract. In the chart above, the spot price is $60. In the normal (green line) market, a one-year futures contract is priced at $90. Therefore, if you take a long position in the one-year contract, you promise to purchase one contract for $90 in one year. Your long position is not an option in the future, it is an obligation in the future. The red line in Figure 1, on the other hand, depicts an inverted market. In an inverted market, the futures price for faraway deliveries is less than the spot price. Why would a futures curve invert? Because, in the case of a physical asset, there may be some benefit to owning the asset (called the convenience yield) or, in the case of a financial asset, ownership may confer a dividend to the owner. A few fundamental factors (i.e., the cost to carry a physical asset or finance a financial asset) inform supply/demand for the commodity, which ultimately determines the shape of the futures curve. If we really want to be precise, we could say fundamentals like storage cost, financing cost (cost to carry) and convenience yield inform supply and demand. Supply meets demand where market participants are willing to agree about the expected future spot price. Their consensus view sets the futures price. And that’s why a futures price changes over time: Market participants update their views about the future expected spot price.